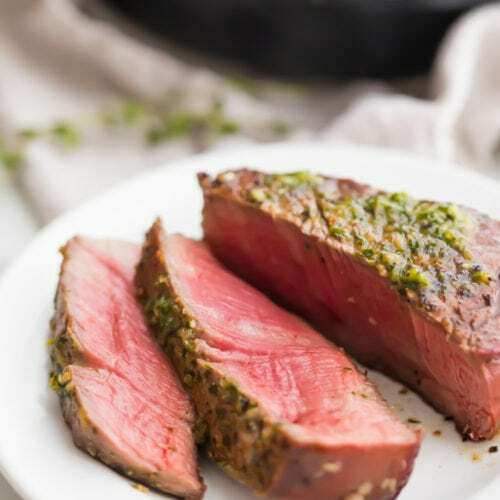 This is only filet mignon recipe you’ll ever need and makes the best filet you’ll ever eat: tender, moist, and oh so juicy. 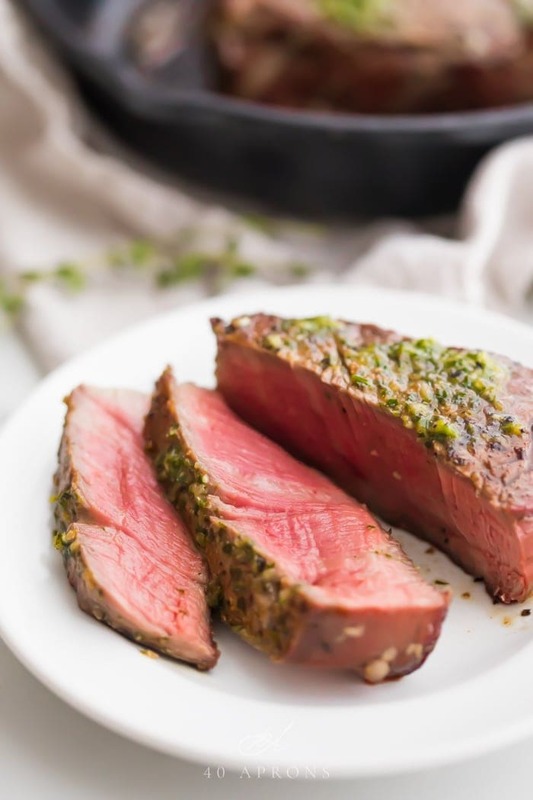 Topped with a super flavorful garlic herb compound butter, this recipe produces an epic meal, thanks to a reverse sear starting in the oven with a quick finish in a cast iron skillet on the stove. This recipe is the last word on how to cook a filet mignon! I worked so, so hard on making this recipe absolutely perfect, but the thing about steak? You don’t know until the moment you slice it open if all your hard work paid off or not. And I had my fingers actually crossed when I was cutting open this steak. I took a bite and holy kerpow, I about fainted. I immediately FaceTimed my assistant / business partner / bff and did my best to digitally slap her. There was no one else nearby and, well, it was the most natural reaction after tasting a piece of filet mignon that was that tender and that buttery and is this actually the best filet mignon recipe ever that I’ve had in my life amen? It is, my friends. It is! If you go back far enough, you’ll see my on-and-off romance with vegetarianism and veganism. I love the idea: an innocuous diet that’s good for the earth and good(ish) for your body, but a few months in every single time I would get the strongest, most irresistible craving for red meat. By body more than wants it; it truly feels like it needs it. I could go the rest of my life without eating a piece of chicken, so long as I have a nice ribeye waiting in the wings. Through a bubbly mouthful of strawberry-flavored toothpaste, he exclaimed, “A steak party? HOORAY!” Well, at least we know he’s mine. So I’m an experienced steak eater and maker. I order the steak whenever it’s on a menu, and I make it as often as I can justify. And when I tell you that this is the best filet mignon recipe ever, you best believe me. What makes this the best filet mignon recipe ever? The filet mignon is insanely tender and juicy without being the least bit stringy. It’s so buttery it nearly melts in your mouth. The reverse sear mimics the sous vide method of cooking. In other words, the entire steak is cooked through evenly before a quick, very hot sear. No other approach to cooking filet mignon yields quite a tender or even steak. The garlic herb butter is out of this world! 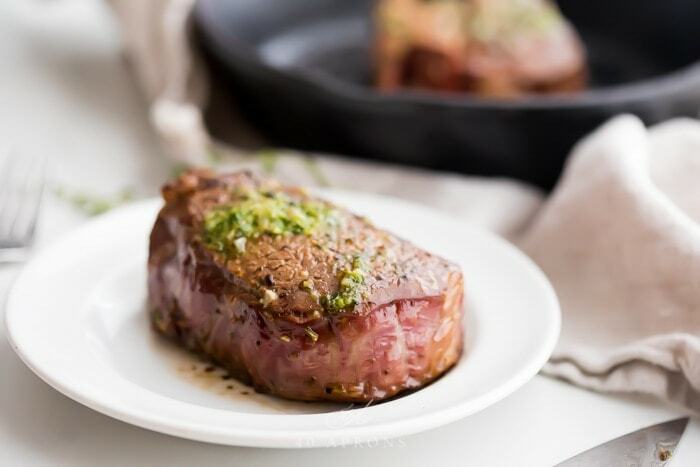 With garlic, parsley, shallots, and lemon juice, this garlic butter is perfect on filet mignon and makes enough to slather on everything from chicken breast to eggs to a loaf of French bread. What’s the best way to cook filet mignon? This filet mignon recipe utilizes the reverse sear, and I’m telling you this so you can talk about it at dinner and sound hella fancy. 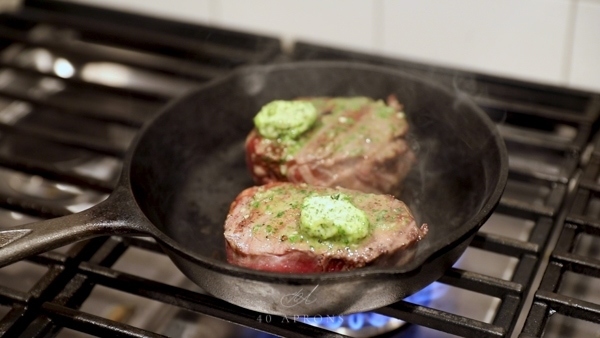 The reverse sear was developed decades ago at restaurants outfitted with sous vide equipment. You can learn more about cooking sous vide at my recipe for sous vide chicken breasts, but the general concept is cooking an ingredient at around the exact temperature you want it to end up in a temperature-controlled environment. For actual sous vide cooking, that means placing your ingredient in a vacuum-sealed bag and cooking in a controlled water bath. The idea is that, cooking at a high temperature from the outside in (Contact cooking or roasting) means you’ll overcook the edges of the ingredient before you can bring the center up to the proper temperature (Around 165º for chicken and about 125º for steak). Precision cooking with sous vide equipment circumvents this by cooking the entire ingredient, like chicken or steak, to that desired internal temperature and then finishing off to give the whole thing a nice crust. The result is the moistest, most tender meat you’ve ever had. Ever. And we’re mimicking that process with our reverse sear. We cook this filet mignon in the oven on low heat to start with and then we sear it on the oven in a cast-iron skillet. By doing this, we cook the entire thing through without overcooking the edges, so they never become grey or stringy. Then, the sear in a cast-iron skillet gives you a beautiful crust and rich, buttery flavor. It’s seriously to-die-for. This recipe for the best filet mignon of your life starts with a simple but super powerful process of dry brining. All this means is liberally salting both sides of your steaks and letting them sit for at least 30 minutes. This process creates a more flavorful and tender piece of meat than you could imagine, and I do not want you to skip it. Additionally, this process allows the steak to come up to room temperature. So again, don’t skip it! It makes all the difference. How do I cook filet mignon in the oven? 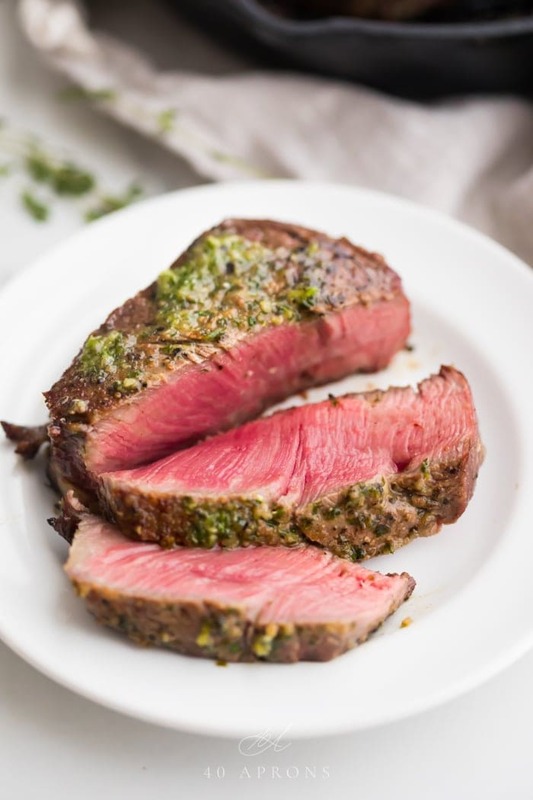 Here’s what I like to do and how this best ever filet mignon recipe recommends you cook your steak in the oven: liberally salt and pepper the filet on both sides and let sit about 30 minutes to an hour on a wire rack over a baking sheet. Then, place your steak in the oven at 250º Fahrenheit until the internal temperature reaches 120º. This will take about 25-30 minutes. How do I cook filet mignon in a cast iron skillet? 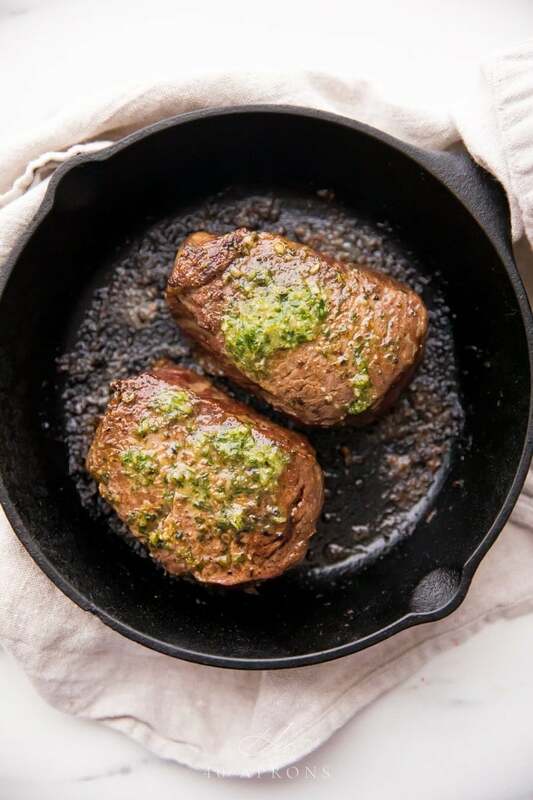 After you’ve cooked your filet mignon to an internal temperature of 120º Fahrenheit, remove the steak from the oven and let sit while you preheat your cast iron skillet over high heat for those 5 minutes. Then, very carefully place the filet in the cast iron skillet and cook for 45 seconds. Flip and place pats of your garlic herb butter on top and cook 45 seconds. Then, you’ll flip your steak a couple times, allowing the browning milk solids in the butter to provide a really rich shade of brown to the surface of your steak, about another 20-30 seconds. 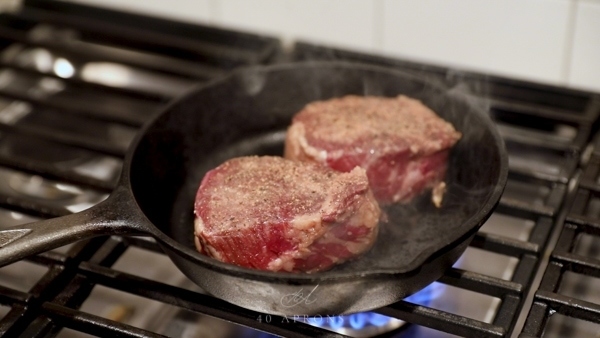 Press the sides of the filet mignon briefly against the sides of the cast iron skillet, just until they are no longer red or pink, then remove. How I make garlic butter for filet mignon? This garlic herb butter is crazy good, and it’s so easy to make. Simply combine all ingredients in a food processor and blend until smooth. Spoon into a long rectangle on a piece of plastic wrap and roll into a log. Chill until firm. Start by dry brining your steak: that’s just a fancy way of saying liberally salt both surfaces of the filet mignon, and season well with pepper. You don’t need to add more salt than you normally would, but be generous with your salting pinch here. 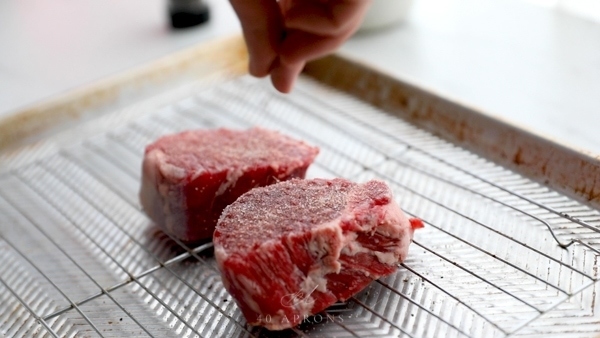 Place steaks on a wire rack over a cookie sheet and let sit at least 30 minutes, preferably a couple hours. Chill in the fridge if letting sit for longer than an hour, and bring out to room temperature 30 minutes before cooking. Preheat the oven to 250º F. Place steaks in the oven and cook until the internal temperature reaches 120º F, about 25-30. I highly recommend picking up a probe meat thermometer to make cooking this (And all meat!) so much easier. When internal temp reaches 120º F, remove. Preheat a cast iron skillet over high heat for 5 minutes. Carefully place steaks in the skillet and cook 45 seconds. Flip and place a pat, about 1 tablespoon, of garlic herb butter on top of steak and cook 45 seconds. Flip steak a couple times until a more golden brown – the steak will start out looking a bit grey. The milk solids of the butter will provide a nice color here, so you’re flipping it a couple times to really coat the surface of the filet. This process should not take longer than about 20-40 seconds. Press the sides of the filet up against the sides of the cast iron skillet for a few seconds at a time or until no longer pink or red. Remove and serve with extra garlic herb butter. No need to rest here since you’ve already done so with the reverse sear! Serve with almost any side dish. They’re all so good with this best ever filet mignon. Bonus points for anything you can slather more of that garlic herb compound butter over! The best filet mignon you'll ever eat: tender, moist, and oh so juicy. Topped with a super flavorful garlic herb compound butter, this recipe produces an epic meal. Liberally season steaks on both sides with plenty of salt, as well as fresh cracked black pepper to taste. Place on a wire rack over a baking sheet and let sit at room temperature for at least 30 minutes, preferably a couple hours. If letting stand for more than one hour, keep in refrigerator, then let stand at room temperature 30 minutes before cooking. Meanwhile, make garlic herb compound butter: place all ingredients in a food processor and process until smooth. Spoon onto a piece of plastic wrap and roll into a log shape. Chill until firm. Preheat the oven to 250º F. Place the pan with steaks in the oven and insert an internal meat thermometer with probe. For medium rare, cook until the internal temperature reaches 120º Fahrenheit, about 25-30 minutes. Larger or thicker steaks will take longer; I highly recommend using an internal meat thermometer with probe here. To cook filet mignon steaks to a different warmth, like medium or medium well, see note. Remove from oven when internal temperature reaches 120º F. Preheat a cast-iron skillet over high heat for 5 minutes while steaks rest. Pat steaks dry. 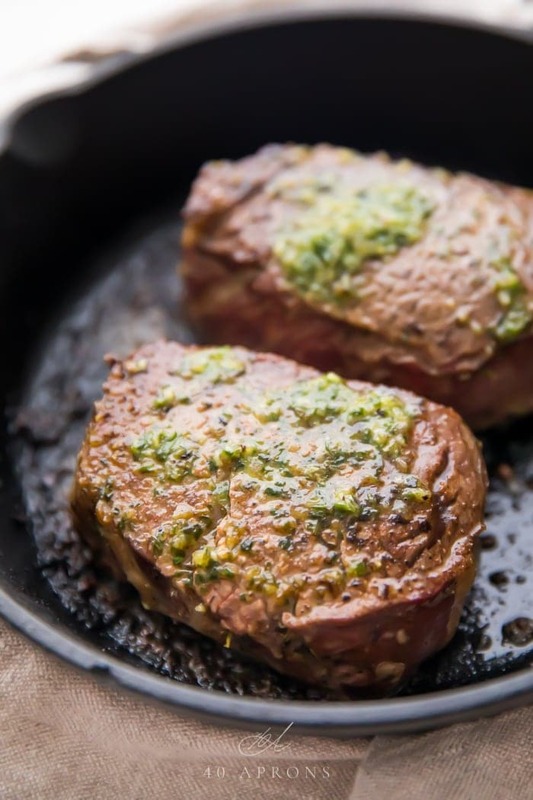 Carefully place steaks in hot skillet and cook 45 seconds; flip and place a pat of garlic herb compound butter, about 1 tablespoon per steak, on top of the filet. Cook another 45 seconds, then flip a couple times until steaks are a richer brown color, about 20-40 seconds total. 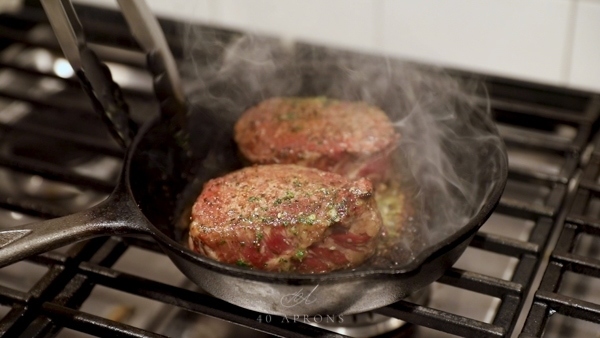 Press the sides of the filet up against the sides of the cast iron skillet briefly until no longer red or pink. Remove from skillet and serve with more garlic herb compound butter. To cook your filet mignon steaks to a different temperature, follow this chart: Rare: Target temperature: 120°-125°F Remove from oven when internal temperature reaches 110º F. Medium Rare: Target temperature: 130°-135°F Remove from oven when internal temperature reaches 120º F. Medium: Target temperature: 140°-145°F Remove from oven when internal temperature reaches 130º F. Medium Well: 150°-155°F Remove from oven when internal temperature reaches 140º F. Can I convince you to cook your steak a bit less? Please? Well Done 160°-175°F Remove from oven when internal temperature reaches 160º F. Please don't do this. Wow, this recipe sounds amazing!! And all your photos make me want to try this recipe right now, even though it around 02:10 am. Oh. My. Goodness. This steak looks so beautiful and delicious! I love a good steak, but I’ll be honest, I’ve never tried reverse searing before. I appreciate your explanation of it. I’m inspired to give it a try! ‘best ever’ idea! Love making and using herb-infused compound butters. I always overcook my steaks, but you wrote so many tips that I’m sure my next one will be an epic win! 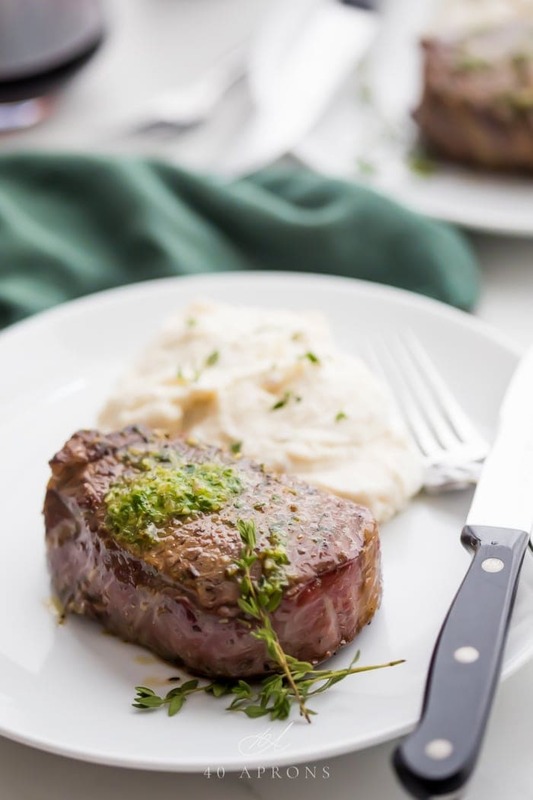 I love filet mignon and the garlic herb compound butter looks so delicious! I’m definitely gonna try this. My husband loves a good filet mignon, so this really is the ultimate date night recipe! This steak looks so juicy and absolutely delicious! That steak looks so good – tender, moist, and juicy delicious. Thank you for all these tips – never thought of dry brining a steak but we do it to pork chops so why not! Thanks! OH wow, that looks sooo perfectly cooked and tender! Seriously drooling. I have to try this! Steak is my favorite! I love this preparation. So flavorful! I am drooling over this!! Reverse sear sound like the way to go! you are speaking to my heart right now! I make this cut frequently, but have never done a reverse sear — thanks for the inspo! you had me drooling with the gorgeous steak. my body craves for red meats too if I haven’t had it for a while. Thanks for such detailed instructions and tips. That garlic butter sauce is amazing with red meat, highly recommend it! I made a bigger batch so I had some leftover in the fridge for steamed veggies and baked potatoes. I mean, that steak looks amazing but that butter tho! Oh, I know! It’s incredible! I’ve never even tried making a filet mignon before. You make it sound so easy! A perfect steak is a thing of beauty…you’ve nailed it!